“For many, sand is the gold standard for bedding in terms of animal comfort and disease control, and it is an excellent choice. However, some of sand’s properties amplify risks if the sand quality is poor or the stalls are not properly managed. For many, the risks and challenges of using sand, from finding or producing a high-quality sand, justifying the cost to ensure consistent and thorough stall maintenance, and the impact on the manure system, have drawn some producers to alternative stalls and bedding surfaces. Regardless of the bedding choice, comfortable, clean and dry are the goals. Every bedding type has its own benefits and risks, but it is critical to remember that no stall bedding is free – every one must be maintained to ensure cleanliness and dryness. We know that no bedding system is free; we just wanted to see if our mattress system was a little closer to free than sand bedding when actual costs were compared. Despite sand bedding initially being touted as an economical, farmers have come to realize there are real costs to both the material itself, as well as the labor involved in maintaining stalls and managing dirty sand once it leaves the barn. 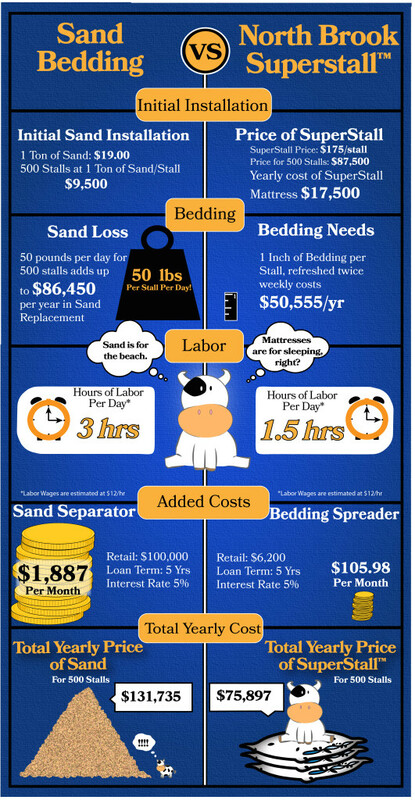 Our calculations are based on real numbers received from customers and farmers from around the country to ensure a realistic comparison of costs of sand ($19/ton), costs of a load of bedding ($130/load), costs for a Superstall mattress ($175/stall), and the costs of labor and machinery needed to manage either system properly. Ultimately, the numbers speak for themselves. If a farmer prices out what it would cost him for the next five years on a 500 cow dairy farm, it becomes very clear that a mattress system will be the more economical option. Combine that with the industry-leading comfort of the SuperStall memory foam mattress system that matches cow health and production numbers from sand bedded barns and the choice becomes undeniable. If a farmer can get the golden standard of comfort and do it for less money, the SuperStall system is the natural choice for cow and farmer. If you’d like to learn more about how we calculated our costs or would like to know more about our memory foam mattress or topcovers, please feel free to contact us! Drissler M, Gaworski M, Tucker CB, Weary DM. 2005. Freestall maintenance: effects on lying behavior of dairy cattle. J Dairy Sci. Jul;88(7):2381-7. Timms, Leo. 2015 July. How to ensure you have good-quality sand: All sand is not created equal. Progressive Dairyman, 29(12), pp. 54-56.